The top nuclear envoys of China and Russia are expecting results from an upcoming second summit between the United States and North Korea. 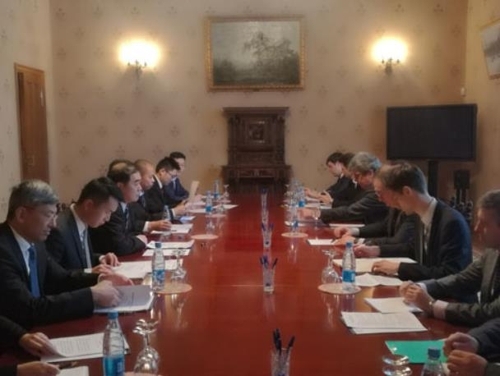 According to the Chinese Foreign Ministry on Tuesday, Chinese Vice Foreign Minister Kong Xuanyou met with Russian Deputy Foreign Minister Igor Morgulov in Moscow on Monday and discussed issues regarding the Korean Peninsula. The ministry said the two officials shared the perception that the situation on the peninsula was moving in a positive direction as tensions have eased through communication. Assessing that the U.S. and the North are seeking to resolve problems through dialogue, they hoped for the two countries to hold a smooth bilateral summit and produce a positive outcome. Kong and Morgulov also reaffirmed both of their countries' support for efforts to improve inter-Korean relations and enhance reconciliation and cooperation between the two Koreas.